Ben Myers (aka @FaithTheology) is on a roll over at Twitter. I don’t know if he’s the creator of the “Pope abolishes hell” meme, but he’s certainly contributing to it in an inspired way. Here are some of my favorites! Here’s my first contribution to the cause. I apologize that it’s not quite up to the high wit-bar Ben has set. Pope abolishes hell. Kicking themselves for allowing Francis to beat them to the punch, Patriarchs Bartholomew and Kirill convene Ecumenical Council. Pope Tawadros wants in, too. Okay, folks, keep the meme going. “Pope abolishes hell. _____.” Fill in the blank. If it’s particularly witty, I’ll tweet it for you. Pope abolishes hell: bear found in restroom. Pope abolishes hell. Congressional redistricting plans thrown into chaos. Haha! I’m going to tweet this but give it a more ecclesiastical twist. Pope abolishes Hell. Canon lawyers debate whether this constitutes a “freezing over”. Pope abolishes hell, Satan declares victory. Pope abolishes Hell. Concerned Satan reaches for his Lossky and Romanides volumes to assure himself that Heaven and Hell are the same thing. Pope abolishes hell. First Satanist Church closes due to low turnout. Pope abolishes Hell. Doomsday preachers hardest hit. Pope abolishes Hell. Politicians mysteriously vanish. Pope abolishes hell. In angry twitter rant, otherwise disinterested religious guy references Bible verse about last days and something about false teachers. Says it’s somewhere in the back. Pope abolishes hell; Satre notes that there are still other people…..
Pope abolishes hell. Man confusedly confirms that all 11 of wife’s cats are healthy and accounted for. Pope abolishes hell. Might as well. After the Harrowing, it’s a ghost town. Pope abolishes hell. World leaders convene to see if they can resurrect it. Pope abolishes Hell, moves it to the Vatican. Pope abolishes Hell; Satan and his minions overwhelm unemployment offices. 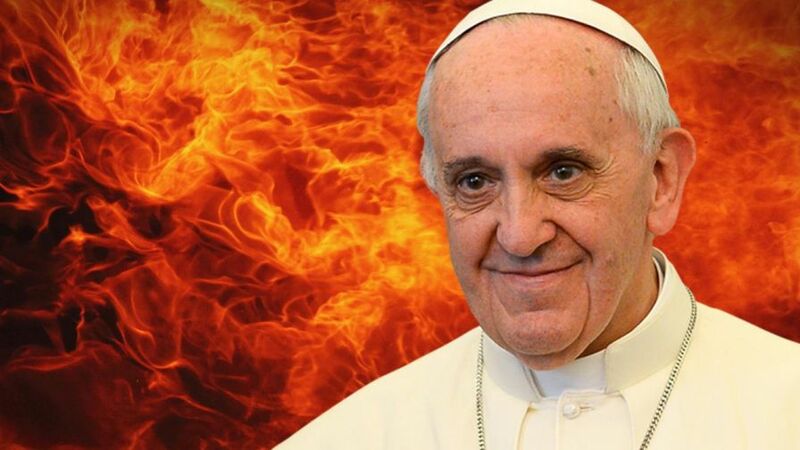 Pope abolishes Hell, renewal of driver’s licenses now in limbo. Pope abolishes hell. Satan upgrades to Mar-a-Lago. Pope abolishes Hell. All attorneys vanish in an instant. Pope abolishes Hell. Origen of Alexandria canonized and named a Doctor of the Catholic Church with his annual feast day on April 1st. Pope abolishes Hell. Book XXI of Augustine’s City of God and Justinian’s anathemas against Origen self destruct 5 seconds after Francis’s declaration. Pope abolishes hell. Vatican abolishes journalist. Pope abolishes hell. Bob Jones University disappears.